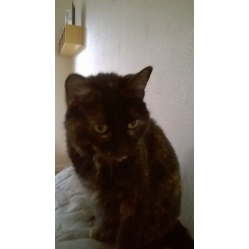 Three 10 year old pretty tortoiseshell sisters, all very friendly. Boji is quieter and likes to eat on her own. Kali-ma is very active and vocal and is the most adventurous. Niamh is always looking for a lap. Fostered in Buckfastleigh. Ideally we would like a home for them together, they have never been apart.